All those right-wingers who long for the good old days of the 1950s might want to reconsider. Pity that there is no data on the wave of undeclared strikes that are implicit in workforce disengagement. Employers have reneged on providing security; workers on providing loyalty. Folks can now go to work and continue their strike on full pay, just so long as they don’t join a union and don’t let their disengagement show. The net effect on productivity may even be higher. Yes, indeed: let’s go back to the tax rates in existence under that Old Bolshevik, Dwight D. Eisenhower. … but it’s also an indicator for the decline of mass production and fordism. Ingo, actually, it’s not just Fordism: a well-targeted strike could cripple any number of firms that depend on just-in-time inventory – manufacturers like auto companies or retailers like Wal-Mart. A single strike at a parts plant could disrupt auto production in several countries. A strike at a port like Long Beach could interfere with Wal-Mart’s entire North American supply chain. Volcker and Reagan really broke the back of labor. And these days Volcker is considered a voice of sanity and restraint. 1. Decreasing combativeness of union leadership – I don’t remember a major union leader in my lifetime (since 1980) who was truly combative with management and with the political system in general. There are really no more Big Bill Heywoods, let alone Shankers. 1A. If the above is true, it has a lot to do with the symbiosis of the major unions and the Democratic Party, and the Democratic Party’s major donor base shifting to free-trade supporting FIRE sectors. The unions won’t leave the Dems, and the Dems will throw unions a bone here and there, but the overall economic policy of the Democratic Party is anti-union. 2. Rise of service workers/outsourcing – so if the old-line industrial sector has dealt with the above, the other part must be the growth of the service economy, which doesn’t seem to lend itself to strikes and organizing in the same was as factory-based labor. Maybe it’s possible – if we had card-check for unions and everyone was part of a bigger industrial rather than craft union, service workers could be organized rather effectively. Perhaps Mr. Henwood has stats on this for other countries? Regardless it seems like the consciousness and combativeness of service-sector workers is far different than their industrial counterparts. None of this is insurmountable, but it will clearly take education, organizing, and probably the growth of a mass labor party to change. “workforce disengagement”: I don’t think so. In today’s workplace, the bosses drive to extract more profit from fewer workers makes this impossible. The threat of layoffs has few taking their eyes off their knitting. If what is meant workers identification with “their” company- that boat pretty much sailed awhile ago. Most workers are only too keenly aware that they are never too far removed becoming WalMart greeters. 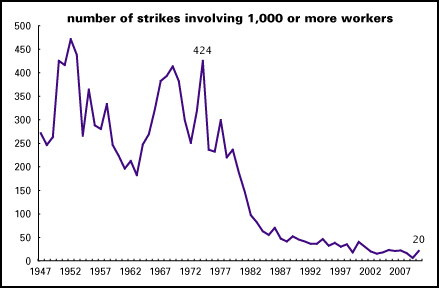 Strikes are singular events. Passive agressive “disengagement” will get us nowhere. A strike means a conscious active “engagement” for action. What the chart suggests is that organized labor is hopelessly disorganized. Either organized labor is circling the historical drain, or we will be entering a period of working class stuggle from which a new model will emerge. I prefer to believe it will be the latter, but this is by no means certain.